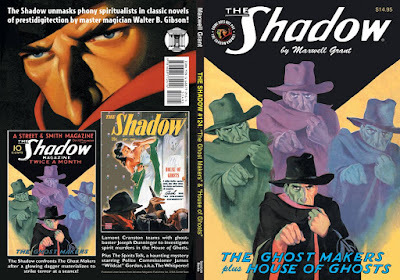 An article by Will Murray exploring the "Gibson-Houdini-Lovecraft connection" is included in volume 124 of Sanctum Books The Shadow. The collection includes two stories in which The Shadow unmasks phony spiritualists, including "House of Ghosts" in which he teams with Joseph Dunninger. You can purchase The Shadow Vol. 124 via the Sanctum Books website and on Amazon. For more information visit Sanctum Books on Facebook. Thanks to Tim King for the alert. Also included in the article by Mr. Murray is a nice mention and a perspective from C. M. Eddy, Jr. While not as big a name, Eddy was someone who was behind the scenes in his work for Houdini. It's nice that Eddy is getting some recognition after all these years being in the background.